Ready to find a home for a few kittens? Separating mom from kittens is a bit heartbreaking -- probably more for you than her. Knowing when to do it -- and how to avoid chaos and freaking out the kittens -- is key to making the transition easy for everybody. Wait until the kittens are at least 8 weeks old. By this time, they're still very adorable -- and as a result very adoptable -- but strong enough to move away from mom. If you're dealing with feral or stray kittens, the rules are different. Taken them away from mom at a younger age -- 5 or 6 weeks -- before they learn to run away from humans as soon as they see them. 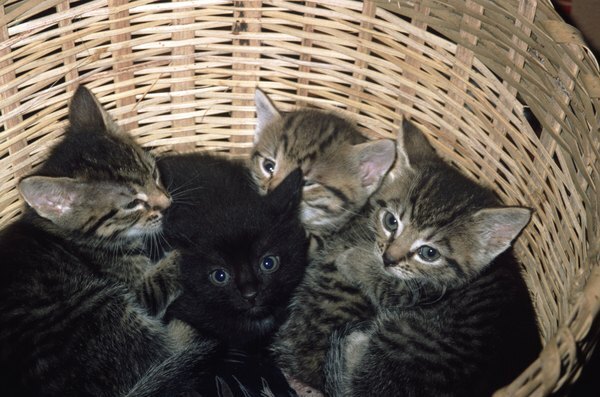 Feral kittens learn early on that people are the enemy -- and by then, good luck catching them. Socialize the kittens as young as possible. This means touching them, grabbing them, petting them and picking them up. This is especially important to get them used to people and make them adoptable. They will also be a lot easier to catch and take away if they already know you, rather than seeing you for the first time when you're ready to take them away. Wait until mom moves away from the kittens. If she's living on her own, she will have to go look for food at some point. If she's not leaving, offer a bowl of food a couple of feet away from where the kittens are staying. Then wait -- you might need to hide while you wait -- until she goes for the food, then go take the kittens. Mom won't move too far? Just go ahead and try to grab the kittens anyway when she's distracted. Start a slow separation process if you can handle the kittens regularly. Once kittens are about 4 weeks, you can start offering them food "on the side" so they're not completely dependent on mom's milk. Don't give kittens cow's milk -- it causes diarrhea -- but instead look for kitten milk replacer, which you can buy at vet clinics. Just a tiny bowl of milk replacer once a day will get the kittens used to you and other food. Once you've taken the kittens away, do your best to catch mom and have her spayed. Is mom your own pet? Rush to the vet the day after all kittens are gone. When Can Kittens Be Separated From Their Mother?